As with so many other DJs and producers, Oliver Deutschmann’s introduction into electronic music came through his friends taking him to a club. This first brush with techno sparked a deep love of the music within him and it wasn’t long before the young DJ was putting on his own parties. As his reputation grew he started getting booked for bigger and better clubs, naturally evolving towards production at the same time. With friend and production partner Stephan Hill he founded Vidab records in 2007, releasing a steady stream of minimal techno themselves and from a small collection of their peers. Deutschmann’s solo productions began appearing at the same time; his steady, peak-time techno coming out on Vidab and other labels like Konsequenz and Polytone. 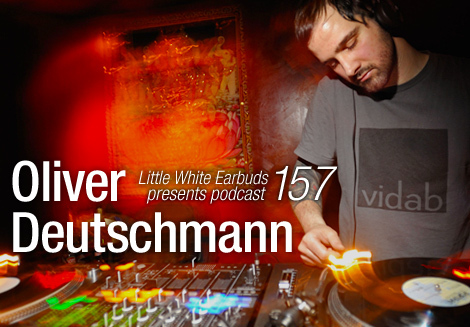 Scoring some successes with the label and with his various projects, Deutschmann continued to extend his reach, turning out deeper house cuts for Aim, Jackoff Records and Vinyl Did It. In 2010 he also set up his own label, an off-shoot of Vidab called Falkplatz whose releases tread a similar path and are of the same high quality. On the eve of the release of his debut album, Out of the Dark, LWE got in touch with Deutschmann to quiz him on the recording of his first long player, some of his many collaborative projects, and his record label. The German producer was responsible for our 157th exclusive podcast, a solid hour of quality techno which shows he’s just as proficient behind the decks as he is in the studio. Before you were releasing your solo productions you were working with Stephan Hill under the name Gowentgone. Is that project still going? Oliver Deutschmann: The Gowentgone project is currently sleeping. Stephan is a doctor and has to work a lot in his job. I also concentrate on my solo stuff right now. But there is already some material we recorded over the last years. We just have to finish the arrangements and productions. So, there will be some stuff coming in the near future. We met at an illegal open air in Berlin where I played one of my first live sets. I used a Korg ESX1 Drumbox, Stephan liked the way I used that machine — he also had one of those. So he asked me to meet one day and to work together on some stuff. That’s how we met. I’m actually interested in the remixes that you guys released — the Marcel Dettmann and Marcel Fengler remixes of M.A.M. and Ibex respectively were absolutely killer. But as much as I have looked I can’t seem to find evidence of there being originals released. The originals of those tracks were never released, that’s right. They are hidden on my hard drive and they will probably never see the light of day. We also had to increase the originals’ sound and improve the arrangements a bit before we bring them out. The two of you founded Vidab Records in 2007. Had you had any experience in working for a label before this? What were the reasons for setting up the label? We had absolutely no experience in doing label work. We even had no releases anywhere. We were sending demos around, of course. But nobody seemed to be interested at all in our music. It was pretty frustrating as we really “burned” for our thing. One day we just decided to do it on our own. We finished a portfolio with releases, artwork and so on and sent it to some distributions. Kompakt loved it. And until today we are totally happy with our decision. It feels good to be not dependent on other labels or people who decide for you. Even if they do it with you. How does Vidab differ from Falkplatz which you set up in 2010? Vidab belongs to Stephan and me. That means we both always have to agree about the label politic. It is also a pretty familiar vibe going on there. All the artists are friends or people we know well. Also the artwork follows one idea. This will never change. With Falkplatz those “limits” aren’t that tight. I release stuff without thinking too much about it. If it’s quality and I like the tracks I just do it. I also like to vary the artwork a bit more. There is no special identity I want to transport. It’s more a spontaneous kind of label policy. And can you tell us a bit about your SubbRoomAssociation project with Tomas Svensson. Tomas and I met when I was looking for a producer for an electro band I was a part of, a few years ago. He produced our second demo. Well, the band split but we wanted to work together and start a new project. That’s how SubbRoom was born. Currently we are working on new stuff. We are recording a lot of live instruments and we also want to work together with some singers, and so on. It should be a bit more live-orientated. Hopefully we find the time to bring that project on stage in near future. How did you first get interested in making music? After some years of DJing I just wanted to produce my own sound. My dream always was to release one vinyl EP. Now it is an album. I am a happy guy. Your debut album Out of the Dark is just about to be released. How long did it take you to record and were all the tracks written expressly for the album? It took me around 4 month to produce the album. I used mainly the hardware stuff that we have in the studio to get this warm, old school sound that I had in my mind. To produce the tracks went pretty easy then. I had a good workflow and I collected a lot of ideas. There are even 10 or 15 tracks more that didn’t fit on the album. So, yes, all the tracks I wrote expressly for this album. Some of the other tracks I may release in the next time as well. You updated one of your first tracks for the album, “Siem Reap.” Why did you want to include this track on the album? “Siem Reap” was the first track that I released as Oliver Deutschmann. I still love this track and it means a lot to me. So, it was like closing the circle. Your productions to date have largely been made up of techno, but there is definitely a love of house and disco in there too, which has come through on tracks like “Waterfalls Are Good,” “Gasolinum,” and your Himmel und Erde EP. Is that a fair representation of your DJ sets, mostly techno with some house? Yes, definitely. In my DJ sets I try to play a wide spectrum of dance music. I like to mix techno with house, classics with newer stuff and so on. I don’t like DJ sets with the similar sound for two hours or more. I mean, some people are pretty good at this and it is definitely good for the flow. But it’s more exciting to take some risks while DJing sometimes and try to combine tracks that don’t seem to work together. Speaking of DJing what are some of your favorite places to DJ and why? Berghain/Panorama Bar, of course, is my favorite spot. The special thing about it is to play extended sets there. You can try so much more in a long set than in a normal two hours peak time set. The other great thing for me to play there is that after all those years, is that I know so many people there. From the bouncers to the barkeepers and the night managers and owners. I just feel like home and familiar when I am there. Other spots I love to play are the Aura.Karma.Alles. parties in Munich or for the Ear to Ground crew in London. Those people are not only throwing great parties, they are great hosts as well and became pretty good friends over the years. So, It is not only the club and the crowd that is pretty significant to me. The interpersonal aspect is just as important. It is an hour of deep techno music that represents a current DJ set of mine. And what can we expect from Oliver Deutschmann, Vidab and Falkplatz over the next year? There will be some remixes for Sierra Sam and Billy Johnston & Gennaro Mastrantonio. I also have an EP coming on Soma Recordings in May. Then there will be my first solo EP on Falkplatz in September and some Subbroomassociation stuff later this year. On vidab, we will release another vidab X from Inland in May.